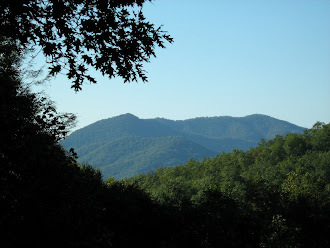 We made a last minute decision yesterday and went for a leisurely ride along the Blue Ridge Parkway...we drove from Balsam Gap to the Oconaluftee Visitor Center which is the end of the Parkway. We thought we might catch the end of the season for Fall colors, that that we did...though the bright colors have morphed into deeper earthy tones, the views were still spectacular. ...we decided to hike the path and see if we could find the top and after turning off onto a little travel path, we found it (we were standing at the big rock you see to the right of the falls in the photo above). ...then we decided that since this was one of only a couple spots we came to that we could turn around, we would head back the way we came. Funny, we calculated the mileage back to be only 3.1 miles one way on that road, felt like much farther than that when we just kept going. We drove back on the Parkway, stopping at many overlooks. As we began descending in altitude, the colors began to pop. It was a great way to spend a Friday afternoon! This is our view today...cold air rolling in, giving lots of cloud cover and making the colors seem brighter. Soon, the trees will be bare...I love that winter look...do you? Thanks for letting me ride along. What beautiful views! Lovely, lovely photos. I miss the Blue Ridge. Wonderful pictures! The fourth from the bottom -- the branch against the sky with the mountains in the distance -- is breathtaking! Thank you for the "babbling brook" photo...I have a thing for those little creeks. My favorite photo is the branch in front of the blue sky...any piece of art. Hugs!